CAMARINES SUR—Former governor and congressman Luis R. Villafuerte raised howl at the recent gruesome massacre of four gold panners in Caramoan last Saturday. 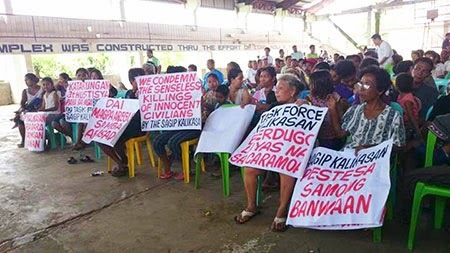 Family members and sympathizers of the Caramoan massacre victims gather at the town hall to air their sentiments against the perpetrators who are believed to be ranking officials of the provincial government of Camarines Sur. “All persons involved in the Caramoan massacre must be brought to the bar of justice,” said former Congressman Luis R. Villafuerte in an exclusive interview by BICOL STANDARD today. “Even if they are my relatives, they should be punished if proven guilty for the crime,” the enraged former solon said. “They have abused their powers and oppressed the lowly and defenseless inhabitants of Caramoan, and for this, they must be held responsible,” he added. Villafuerte declared Gov. Miguel Villafuerte and his cohorts together with other provincial officials who have been positively identified by Sueno as the persons responsible for the incident, must be charged at the Office of the Ombudsman, apart from facing criminal charges. “They are using government employees in a private business. That should not be condoned, as it is against the law,” he explained.